The UK creative industries were worth a record £76.9 billion to the UK economy in 2013. Growth in the creative industries was higher than in any other UK industry and was three times the average increase in the UK economy during this period. The sectors, which include advertising, architecture, crafts, design, film, games, publishing, museums and galleries, music, technology and television, are an important source of job creation for the UK. Studying Art & Design at St Charles Sixth Form College is the first step to becoming part of the UK creative industries. The skills you will be taught as an Art student at St Charles will prepare you for a diverse range of pathways – whether you want to be a Vehicle Designer, Architect, or an Illustrator, St Charles can help you to prepare for the next step, and begin your creative career path. Most students who wish to pursue Art & Design beyond A Level go onto study an Art Foundation Diploma, and then access Higher Education, which is the preferred route for most creative degree courses. In progression routes where a Foundation Diploma is not a requirement (Architecture for example), many students also progress straight to degree level. The department has built links with many leading creative universities, and many students gain places at prestigious institutions such as University of the Arts London Colleges (Central Saint Martins, CCW, LCC LCF), The Royal Drawing School, Ravensbourne, Middlesex, and further afield in Bournemouth, Edinburgh, Newcastle and many more. The range of specialisms applied for is diverse, but may include Fine Art, Graphic Design, Animation, Architecture, Product Design, Engineering, Fashion Design, Textile Design, Surface Pattern, Photography, Fashion promotion and styling, Marketing and Computer Games Design. All our students who wish to progress to either Art Foundation Diploma or an undergraduate degree are successful in doing so. A Level – Delivered in 2 years. The qualification consists of 2 components – Component 1: Personal Investigation (60% of A Level) and Component 2: Externally Set Assignment (40% of A Level). Both components are internally assessed and then externally moderated. From September 2016 AS Level achievement does not count towards the A Level qualification, as they are distinct and separate qualifications. A01: Develop ideas through sustained and focused investigations informed by contextual and other sources, demonstrating analytical and critical understanding. A02: Explore and select appropriate resources, media, materials, techniques and processes, reviewing and refining ideas as work develops. A03: Record ideas, observations and insights relevant to intentions, reflecting critically on work and progress. A04: Present a personal and meaningful response that realises intentions and, where appropriate, makes connections between visual and other elements. 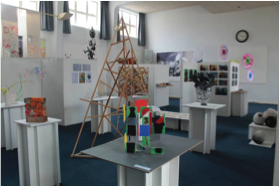 You must meet the St Charles entry requirements for a Level 3 programme including GCSE In Art & Design at grade 4 (C). If you do not have a GCSE in Art & Design, a strong portfolio of work that demonstrates an appropriate ability is acceptable on interview. This will allow us to diagnose the appropriate course and level for you. 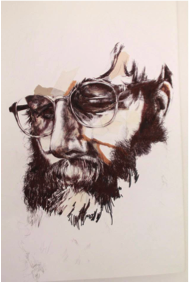 We require students to buy an Art kit upon arrival to the department at a cost of £20 this will include sketchbooks/paper, paints, pens and pencils, brushes, colour digital printing, stencils and mount board/foam board for exhibition purposes. The department provides all other specialist materials that may be used. The Art and Design department comprises of 5 teachers and 1 specialist technician with expertise in a wide range of techniques and processes. Department staff have studied and worked at a number of prestigious colleges including; Central Saint Martins, Chelsea College of Art, Edinburgh College of Art, London College of Fashion and The Royal College of Art. Most of the department staff continue in their own practice, engaging with contemporary art and design – this includes the following areas; Printed Textiles, Ceramics, Photography, Jewelry, Fine Art, Illustration, Graphic Design, Furniture and Interior Accessories and Games Design. Head of Department is Melanie Rye she has been teaching at St Charles for several years. If you have any further questions regarding the courses within Art and Design, Photography and Textiles please contact her either via email mry@stcharles.ac.uk or via the main switchboard 0208 968 7755.